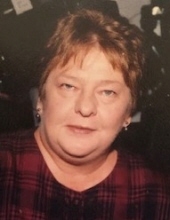 Louise C. "Wezer" Damen (nee Holownia), age 73, a resident of Bolingbrook, IL, since 1973, passed away peacefully on Friday, January 25, 2019, at Adventist Bolingbrook Medical Center in Bolingbrook. She was born on April 9, 1945, in Chicago, IL. Beloved wife of Martin J. Damen, whom she married August 14, 1965, loving mother of Jo-El M. (Howard) Grossman of Bolingbrook, Jodie (Steven) Goecke of Huntley, IL and Christopher M. Damen of Chicago, adored grandmother of Joshua, Zane, Owen and Eden, devoted daughter of the late Edward and Josephine (nee Karpiel) Holownia, dear sister of Patricia Verzak of Naperville, fond sister-in-law, cousin, aunt, great-aunt and friend of many. Louise grew up on Chicago's South Side in the Back of the Yards neighborhood and attended Visitation Grade School and High School (Class of 1963). Louise was a skilled seamstress and enjoyed arts and crafts. Visitation Tuesday, January 29, 2019, 3:00-8:00 PM at Friedrich-Jones Funeral Home & Cremation Services, 44 S. Mill St, Naperville, IL. To send flowers or a remembrance gift to the family of Louise C. "Wezer" Damen, please visit our Tribute Store. "Email Address" would like to share the life celebration of Louise C. "Wezer" Damen. Click on the "link" to go to share a favorite memory or leave a condolence message for the family.